Problem: Gastrointestinal bleeding with occult cause. In our department for general surgery we quite frequently treat patients with obviously a gastrointestinal bleeding that many times even leads to the necessity to give several units of blood. Many times, searching for the site of bleeding, we find nothing. 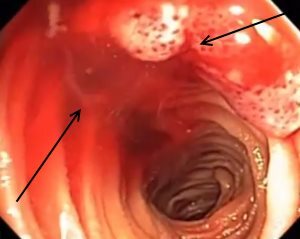 Starting from gastroscopy and colonoscopy and even enteroklysma in many cases we are not able to identify a reason for bleeding or at least an area where the bleeding comes from. Often these patients are admitted to the hospital some time after this with another episode of (recent) bleeding. We suspect angiodysplasy as the reason for most of these cases. But proof of this is very difficult: Many patients are admitted when there is no more acute bleeding, so colonoscopy only shows blood in the colon. As radiologists tell me, a flow of 4ml per minute is needed to show the bleeding vessel even in a superselective angiogram. Similar rates are true for nuclear medical methods. In all cases we tried these methods, we failed to reveal the bleeding site. Most times the bleeding is not sufficiently strong or the patient comes too late, the bleeding has already stopped. Do you (who? how many of you?) perform an elective right colectomy in these cases? (Literature says, 87% of angiodysplasy sites are in the right colon) If bleeding happens every 3 Months? every year? needing …. units of blood a year? What would you do, if such a patient came twice a year, with haemoglobin 6 ? Once you have excluded an upper GI source (something that MUST be done on all “lower GI bleeds” because most of these originate above the ligament of Treitz) and assume it is from the colon, I would do a colonoscopy – but be careful of the reason you think you are doing this. We are only talking now of gross hemorrhage, not melena or occult positive guiacs. The colonoscopy can confirm or exclude ischemic colitis and rectal varices, as well as any colonic masses(the latter only rarely a cause of hematochezia) – the former two are not surgical lesion in the acute phase, and medical management is all that’s needed. Colonoscopy is NOT done to determine the bleeding source OR to visualize diverticuli(also a major cause of colonic bleeding) or angiodysplasia! The former can not be done because you can’t scope while active bleeding is present, and the latter help you NOT AT ALL! Virtually all patients over the age of 45, and many younger, HAVE diverticuli and dysplasias, so seeing them should be no surprise. What you really want to see to be able to limit your surgery (which by the way WILL be necessary – this bleeding is typically intermittent, but never stops once the first episode occurs) is the source of the bleeding! Almost nothing ever shows us this in this day and age – arteriography is the most specific for this, but is positive only 5% of the time, and therefore is NOT justified as a routine measure, and tagged RBC scans are more sensitive but less specific, and in my experience almost never helps to do what you most need – specifically localize the bleeding source. After colonoscopy we offer the patient a total abdominal colectomy, explaingin the natural history of this process – most of the time they decline at the first episode – understandable – but never worry because they WILL be back, and usually as the number of bleeds increases, so does the willingness to finally believe us and submit to surgery. The safest thing to do blindly, without localization (which is where most cases end up – the only difference in various institutions is how many thousands of dollars in unnecessary tests have been done by then – knowing the natural history of the disease should greatly limit the tests) is total colectomy – you are gambling by doing only a hemicolectomy, and not with your welfare, but the PATIENT’s! In fact, large sereies show that the source (IF it is ever determined) is equally likely to be from right or left colons! Also, what’s the difference, once the patient is already under anesthesia, truly, between a hemi- and a total colectomy? In fact, no one has shown any difference in mortality or morbidity between these two. Now certainly I would prefer to do only a hemicolectomy if I could RELIABLY localize the bleeding to one side, but the fact is, this is uncommon. I have already seen enough cases using the “gamble with the patient” mentality in which the patient continues to bleed (surprise!) after a hemicolectomy – in every case following even a tagged RBC scan purporting to show the site of bleeding! TWICE in my 15 years of practice have I seen arterriography localize the bleeding. So, I have evolved to offer the inevitable to the patient at the first event, rather than wait for an exchange transfusion or two and 25,000$ of tests done over and over again – this is one disease where you can accurately predict the long term clinical course to the patient Now there are occasionally small bowel sources, but virtually always these are from lesions , usually diverticuli, which are visible at laparotomy – that’s why, whenever I operate to do a total colectomy, I also determine to resect any obvious small bowel lesion at the same time – I have yet to miss a bleeding source with this approach (knock on wood!). I agree with most part of your comments both from the book and experience but I still can’t accept the minor morbidity of discomfort to the patient with total colectomy, the frequent and not formed stool, especially the ones who only present with the first episode. I believe these conditions have their causes, which believe to be overdistension of the colon causing the overstretching of those vascular lesion. I have seen cases with no definite site of bleeding from colonoscope but the telangiectasia. In these patients I reviewed the history including the past habit of stool passing. They had history of chronic constipation or some sort of colonic motility abnormality such as those with cord lesions or prolonged bedridden ones after a major head injury. I did not do operation on them, I simply gave them stool forming agents and self enema every other day. They never came back with lower GI bleeding. Which if they did so, I would then suggest total or hemi colectomy. This is a nice approach. Twice I have seen patients who did not stop bleeding after definitive ulcer surgery and total colectomy. These do not disprove your discourse, just show that nothing works every time. One was a VA dialysis patient and one was a rural severe COPDer (could well also have been an alcoholic, I just don’t remember). When this problem cropped up a couple of years ago I thought of injecting fluorescein IV and illuminating through the colonoscope with UV light, or trying an ordinary light source. However I understand that quartz optical fibres block UV light, and before we had a chance to try it our patient no longer needed a colonoscopy. A most vexing problem we all face. Most of these patients are elderly with many associated cardiovascular or pulmonary problems which make them poor surgical risks. I would do an upper GI scope first to rule out a problem there and then a colonoscopy. As you have already stated – often the bleeding source is not obvious. My main objectives are to exclude a rectal lesion (where the suggestion to do a total colectomy will not work) and to get to the ileocecal and exclude a bleeding from the midgut. If you have a high pressure irrigator, it is helpful in clearing the clots from the bowel wall. Having excluded these, and if the patient continues bleeding, I would offer the patient a total colectomy. Intraoperatively, you may be able to identify the source of bleeding to a localised segment by doing an intraoperative colonic lavage (intubate the cecum and irrigate, followed by colonoscopy). If so – you can just do a segmental resection with or without a stoma depending on the patient’s status. Do make sure you check the perianal region as well as I have seen a number of patients bleeding massively from anorectal ulcers (stercoral or due to SRUS). Our own experience here is we have a number of patients who have bled from the right colon, not so much from angiodysplasia but rather from right sided diverticular disease. These patients seem to present at an earlier age (40-50 years) and tend to have recurrent massive bleeds. I work in a hospital where we do not have colonoscopy and you have to refer the patient to another hospital do do that. There is no facility for angiography or nuclear scan. Last month I had a 40 year old male patient who was bleeding PR for 3 days and on admission his Hb was 30%. Upper GIT endoscopy was negetive. There was no history of previous bleed. He continued to bleed and after 8 unit transfusion his Hb was 25%. I explained the position to the relatives and did an emergency laparatomy at 2 AM. There was a irregular hard lump involving the caecum and terminal ileum.There was no other obvious site of bleeding. The liver was healthy and apparently there were no palpable LNs. I did a right hemicolectomy. Pt stopped bleeding and had an uneventful recovery. Histopathology of the specimen showed evidence of tuberculosis in caecum. I have started anti TB chemotherapy. This goes to show in my part of the world you have to remember TB as a cause of occult PR bleeding.